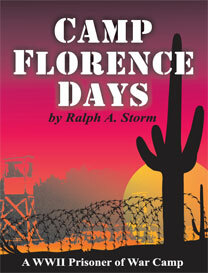 True account of eleven months in an Arizona prisoner of war camp during World War II. The story of nine Army recruits from Camp Grant, Illinois, who received their basic training in a hot desert climate, then served as military police guards in a POW camp in southern Arizona. Only a few German prisoners were housed in the Camp Florence prisoner stockade in 1943; the majority were Italians. After the Allied invasion of France in June of 1944, great hordes of German prisoners were shipped to Arizona camps where they were encouraged to pick cotton for the American war effort. The writer was in a group of MPs sent to the Poston Relocation Camp in early 1944. This concentration camp housed as many as 16,000 Japanese Americans. These evacuees were victims of the anti-Japanese hysteria that incensed many West coast Americans after the Pearl Harbor attacks. The writer draws from his own letters that he wrote home as a 19 year old from a small town in Wisconsin, as well as extensive research into the background of the subject matter.